Replacement: None. 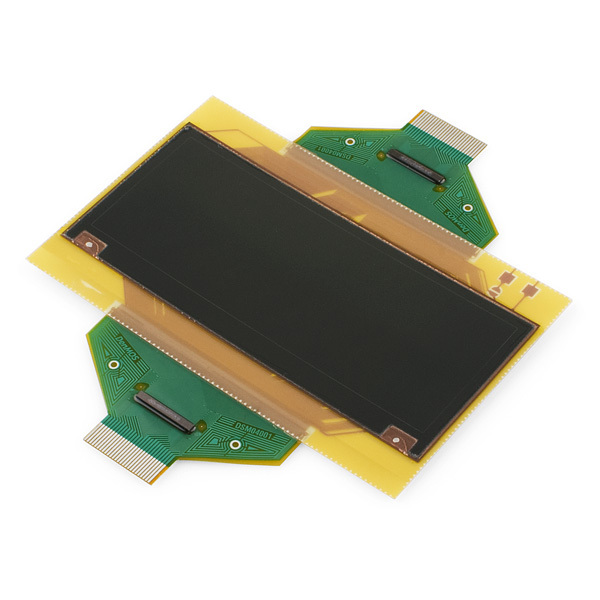 We are no longer carrying this LCD module. This page is for reference only. E-paper displays are rad. 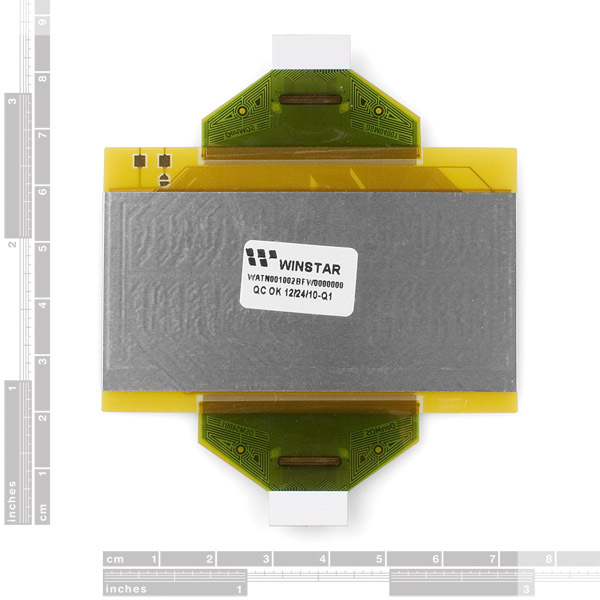 Also known as 'eink' displays, they can maintain an image even after power has been removed. They also have very high contrast and low power consumption. This particular display is a 10x2 character display, allowing you to display up to 20 characters. Check the datasheet below for information regarding the display driver and pinout. It looks from the picture like it would need two of the mating connector, is that correct? I googled the pants off this display, and although I found several people tinker with it, it looks like not many people, if anyone at all got this thing off the breadboard and into a finished product. I made a PCB for it and powered it off a 3.7V LiPo battery. Check it out: http://kevinrye.net/files/epaper_clock_final_assembly.php If you go to the bottom of the page, you'll see the older posts so you can see the project from start to finish. Full source files are posted too. Is this going to be replaced with something similar? I came here to order two spares, and found the product retired. Why is this now retired? I was literally looking to buy this after seeing it a few weeks ago, and now I find it in the retired section. Why? I've had my display for about a month. I've been so busy with other projects I just haven't had the time. I just finally got the chance to hook it up and give it a go. Seems to be working OK, but the last character on the first line of the display shows half of a "K". I wrote to the display, changed the text, and now the "/" and "\" parts of the K are stuck there. I've rewritten over it many times, and I just can't get rid of it. Am I doing something wrong, or is this display defective? Does anyone know a trick to "force" it to clear? Every other character is fine but the last one on the first row. How many Pins is this and could it work with the Filmduino and if not, do you have one that would? I'm interested to hear or, better yet, see, how one integrates this display with a case. I've got a project that needs a case. I'll be building maybe 5 to 10 of this devices, so all the case work will have to be custom. What is recommend or what have others done? I was playing with this e-paper and breakout board and noticed that the picture gradually fade out when disconected from the power supply. In 24 hours the picture is bearly visible. It looks like the display discharges gradually. Is it expected or my sample is just defective? I have one that I sent display data to about 6 months ago and is still very clearly visible. I had to write the display data several times to make it very dark: I use a sequence like the kindle display - I write the inverse of the existing data then all black then all white - this helps eliminate any ghosting of the previous display data. Then I write the new data a couple of times (with a rest in between of about 500mS) to build a strong contrast. The fade rate is affected by temperature, do you have it very hot or very cold? No, the temperature is normal (air-conditioned office environment). I will try your update algorithm, but I think my problem is related to slow discharge. 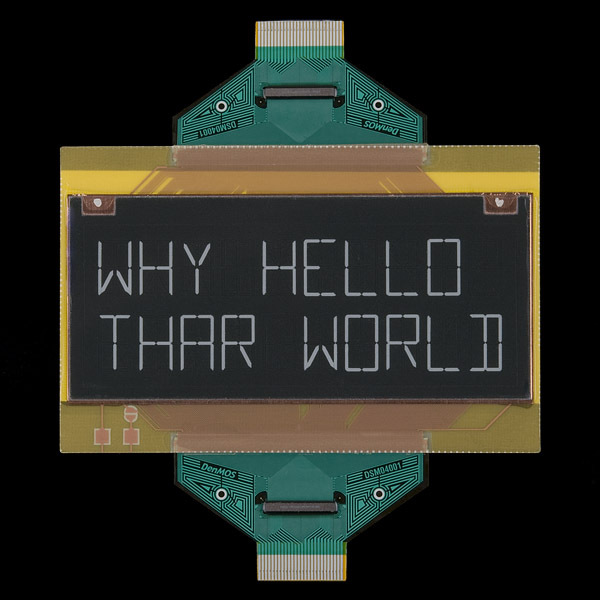 If I just re-connect the power to my Arduino controller, the e-paper display updates itself and I see original bright display again. Will replace the display and / or breakout board, may be it is just defective. 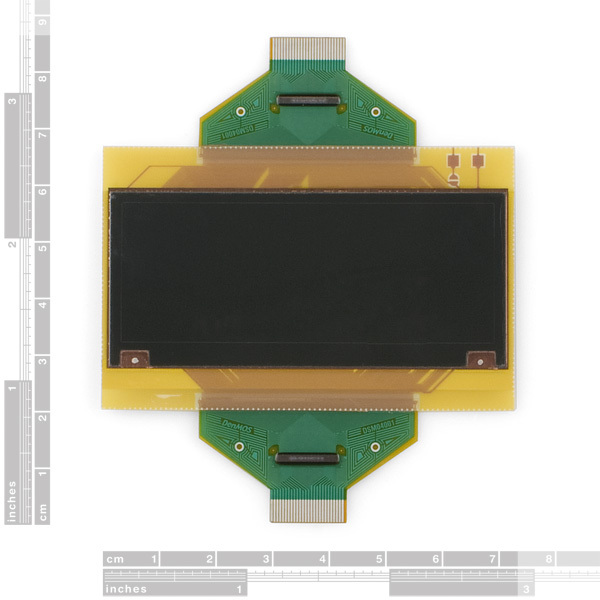 I have also a 2" e-paper display from PervasiveDisplays (evaluation/development kit) and it keeps the picture unchanged forever. Finally got around to powering this up with the breakout board. You can run black on white - just invert the BW, COM and data signals in the code. These displays are really cool when you get them running. Do other peoples use ~15mA when they're only running the stepup convertor (no display updating). I fixed this by connecting the VCC pin to an IO pin, that way the whole display can be turned off when all the IO pins are low. Your post is very cool do you have any code examples how you got the screen running so well? Noob question... why does it have two ribbons? One controls the top line and the other the bottom one? I ordered and received some of the new ePaper displays. New meaning, after the last re-stock around august 10th. I noticed that the ribbons have a thin line of glue running along the seam. Also the front looks a little bit different. What are the changes/ improvements if any? Thx. I just received my replacement today and it looks like they are much better glued now. I am trying to tug on the ribbon slowly and it is not coming apart. Thanks sparkfun! so far i bought 4 of these displays. while i like them, i noticed that the 26-pin plastic ribbon breaks off very easily from the main rectangle/display. this happened to two displays. i now started using scotch tape to create extra support where the ribbon meets the display. This same thing happened to me today. I ordered 4 displays and within 10 minutes the ribbon was slowly coming loose and the display was fading away. I tried to retape them but it simply does not want to attach. Would it be okay to use a hot glue gun to secure this ribbon (glue on top obviously). I finally got this guy working with the breakout board but I am having issues. It doesn't "refresh" all the well. Looks like the screen has "burn-in" similar to LCD and plasma screens. Maybe I have a defective screen? Anyone have any tricks for getting this thing's tails plugged into its connectors? They're really floppy and the connectors are really tight. Without making any crude analogies, I'm concerned I'm going to damage the tails before I get them in. The trick: There are two tabs, one on each end of the connector. Pull them out (I needed a screwdriver), then the tails slide in easily. Correct, it's a locking connector. 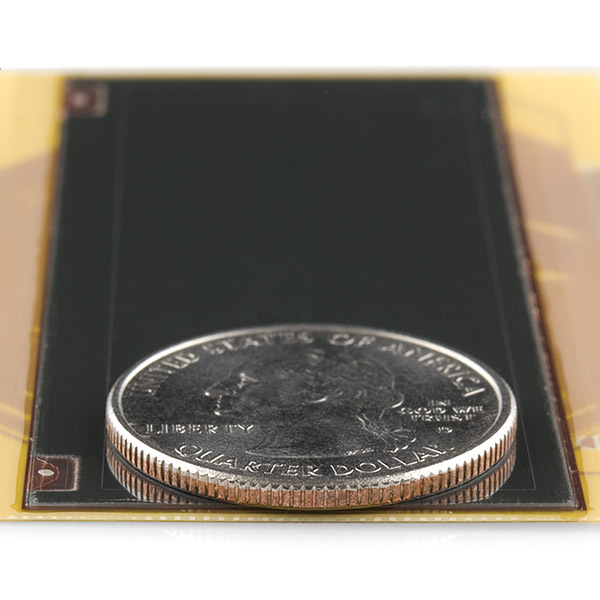 does any know of any other flexible (bendable) displays about this size? Any news on a breakout board? preferably including stepup converter ? Does any one know the minimum bend radius of the stiffened section of the fpc (the yellow part with out the screen)? If no one knows i will order a spare for some structural testing and let you guys know what i come up with because it wasn't in the data sheet. Not mentioned in the description (but is in the datasheet) this requires ~5V for logic and ~35V to drive the segments, SFE may want to add this bit of info to the product description. 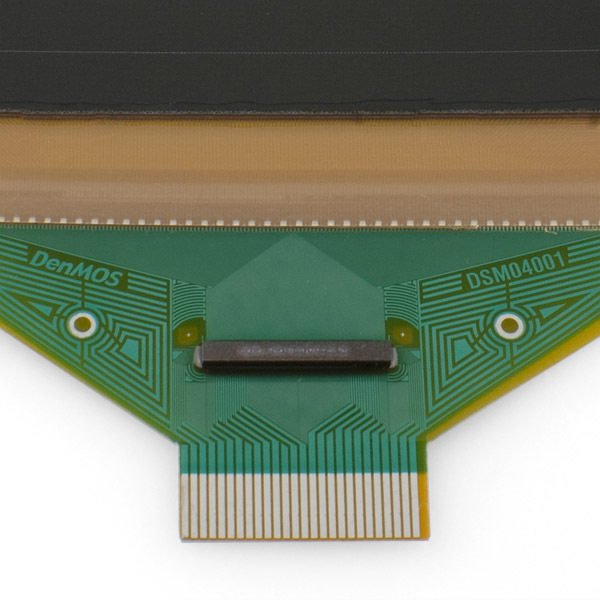 The display has two independent drivers, one for each line, so to fully use both lines of the display you would need two of the matching connectors (PRT-10151). Just speculation but with each line having its own driver you could, in theory, have two different devices each have its own line to work with. As bbotany suggests you may be able to use the display as White Background+Black Segments or Black Background+White Segments, page 22 of the datasheet shows this but is not clear about it at all. Unless SFE can confirm I don't think that will be answered until people receive their displays and start messing around with them. 1) Display requires ~5V for logic AND ~35V for segments. 2) Yes you need 2 connectors to fully use display, see above. I managed to run this display off a single 3.3v supply using a boost converter to supply ~32v to drive the segments. I think the datasheet is implying on page 22 that there are two versions of this display available; white on black, and black on white. By the looks of things, sparkfun are selling only the white on black version. The data sheet has a "Back Grand" connection, and a "B.G." value overloaded on Y1 along with segment 'A' of D1. It seems likely that "Back Grand" is either background, or back ground (homonymous, but not quite the same electrically), and that on of the Y1's should be Y0. If it turns out that it's background, and is simply addressed on Y0 (spec'ed on timing, but not defined for as any particular output), then it should be possible to have black bars on a white background. If that's the case, than I hope to put on in my next order. If it's not... well, white on black is not the kind of print that I like to read. Anyone have a test of this? Any chance of a 14 x something version? I see a ultra-low-power HP-41-compatible calculator watch in my future. This is definitely cool and I want to encourage you to get more things like this, but 20 chars just isn't enough for me. If you could get your hands on much higher resolution e-paper I would buy it in a second. Especially if it's flexible so I can build arm wraps. It is a transflective display so I don't think it keeps the image after the power is removed, but it does go into low power mode. And it is easy to read in sunlight. I plan to connect it to the beagle board to make my own e-reader. Hey those are cool. Thanks for the link. Definitely tempting. Could make a nice tablet/ereader. What I was talking about though is flexible ereader screens in higher res (or any type of screen actually). I've seen flexible OLED's before although I don't know where to get them. I would love to make a cool arm console for controlling my house :P Why hog the remote when you can strap it to your arm? You can't get them. They've been showing them off as concepts for a really long time, but they have durability issues. I'm sure within 5 years time they'll be available, but probably not before then. I did see some impressive videos recently so maybe they're better, but its so hard to say. when the break out board is coming? Are you guys planning on making a controller board for this? The day the refresh key on your keyboard wears out.